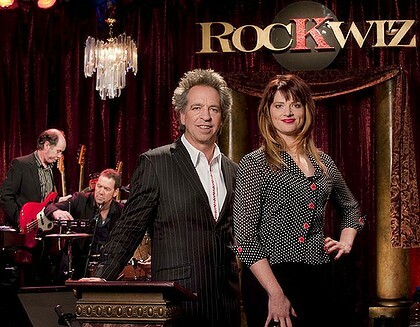 Co-creator and co-host of ‘RocKwiz’, Brian Nankervis (left) with host Julia Zemiro. This week, another first for the site – my first interview with an actual game show creator. Mr Brian Nankervis is an actor, comedian, writer producer and one of the brains behind the successful music quiz show RocKwiz, and I was chuffed when he agreed to meet with me, to talk about how it all began…. SH: RocKwiz is a successful Australian music game show that started in 2005. It’s been running for 13 seasons now and shows no signs of slowing down. I’ve already spoken to the show’s host, Julia Zemiro, and today I’m delighted to welcome her co-host – and importantly, the co-creator of the show – Brian Nankervis. SH: Brian, for those who don’t know, you have a long successful career here in Australia as a comedian, actor and comedy performer. When did you start doing all of that? 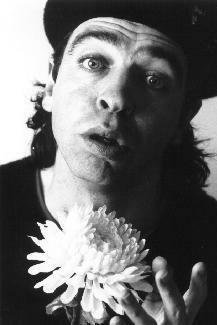 BN: I started doing that in 1985 at The Last Laugh, in Melbourne…. There was a weekly improvised soap opera called Let The Blood Run Free. It would happen every Thursday up at Le Joke. They were looking for performers, and I was invited to play Dr. Ray Goode, a whiter-than-white, altruistic doctor and I really didn’t take it that seriously. I thought I would do a couple and then eventually they will find a proper actor or a proper standup… it did alright, I found that I could improvise within certain limits, and loved it. The show was very successful, and we did probably 12 Thursday nights in a row. One night the hospital – St Christopher’s Hospital – part of the script was that we were having a telethon as hospitals sometimes do. They thought it would be funny if each person did a little act. I remembered my time at (Melbourne radio station) Triple R when I had interviewed some street poets and I thought maybe I could do that; it appears to be incredibly deep and meaningful but is actually complete crap and I will sell it. I did, and based it on these street poets that I had interviewed on Triple R a couple of years earlier, and it went really well. That night, there was someone from Hey Hey It’s Saturday in the audience and she came up to me and she said “that was hilarious, you should be doing that on Hey Hey It’s Saturday.” I went on, won, and became a regular. Which meant that I had a bit of a profile, which meant I got booked for comedy nights. I had to write some more poems. So I started doing (the character) Raymond J Bartholomeuz as a character in standup venues all around Melbourne and loved it. I did the quiz, and people loved it. I’d divide the room into two, or I would say “Boys versus Girls” or I would say “Left Side versus Right Side”, and it absolutely was a huge hit every time. I kept doing warmups and I did warmups for The Panel – for however long; five years? I did Thank God You’re Here, I did lots of shows. I continued to do Raymond J on Hey Hey It’s Saturday. Then I started doing the quiz as part of my standup routine. I would do Raymond, but I would also do a music quiz and it always went well. Then in about 2003, Peter Bain-Hogg – who was the original man who got me to do the warmups – rang me and said “I just came out of a meeting, Renegade Films want to make a pilot. We think the time is right for a quiz show, a music quiz show. Would you like to be involved? I know you do your music quiz…” I said “Absolutely, that would be great”. We met and discussed it, we roughed out a broad structure which was a collaborative effort and effectively it was the structure that we now have today. We have a house band, we get audience members up at the start of the night and we run a quiz to see who the best are, they become the contestants for the show, we have a Who Can It Be Now? segment at the start where we find our guest artiste. Then we have our Million Dollar Riff segment where you have to pick a riff, then we have Master Blaster, where each of the guest artistes nominates a specific topic and we have 5 questions that examine that topic and then we have a fast section, then the show finishes with a duet. That’s really the format that has lasted, that is still going ten years later. We made a pilot in 2003 at Chapel Off Chapel where I was the host. We shopped it around to all the stations, they all said “Thank you, it is terrific” then “No”. Then there was a change in management at SBS and Peter Bain-Hogg re-submitted it to the new guy, Matt Campbell, lovely guy. And Matt said “You know what? I think it’s great; let’s do it… however, given our background as an ethnic broadcaster, we need to have the host with an ethnic background”. “Nankervis” might sound slightly exotic. In fact, it is Cornish by way of Belgium. BN: That’s exotic, but not quite their demographic. I was heartbroken, but I thought “Well, I could either remain heartbroken and we don’t do it or I will swallow my pride and we find someone”. We auditioned Anh Do, Jay Laga’aia and Caroline Tran from Triple J… and then someone had seen Julia Zemiro at a Spontaneous Broadway show and thought it was incredible and so we auditioned Julia and she was so fabulous that there was really no doubt who we should pick. We picked her and I became the sidekick. We put the house band together, they were all pals that we worked with. “Lucky” (Peter Luscombe), Mark Ferrie and James Black, and not a lot has changed. There you go. How’s that for a ridiculous answer? Not ridiculous at all, Brian – I loved it! Particularly from my perspective as a comedy nerd growing up in Melbourne in the 80s. As a teenager, I fondly remember watching Brian, as Raymond, on Hey Hey It’s Saturday, and laughing my head off. So, I’d just like to officially and publicly thank him for those happy memories, which I don’t think I got around to doing in the interview. Next week, our chat continues, with Brian discussing network interference (or lack thereof), re-adjusting dreams and tempering expectations, and how they converted a successful TV quiz show into a touring, theatre-filling LIVE phenomenon! See you then! I wrote an eBook, that you can get here. This has been the first in a series of economical non-sequitur eBook plugs at the end of my weekly post. Thank you.